Another spider post! | Random moosages as I see fit. Disclaimer: This will probably be the last spider post for awhile. I thought I’d just get them all out now. This is the third post in which spiders appear. You might think that I really like spiders, that maybe I’m an arachnophiliac. I’m not. And actually, I grew up being quite frightened of spiders. Not a full on phobia, I mean, I could kill a spider if I had to and I wouldn’t run away from them. But I remember more than one time when I had to mark pages in my science books in elementary school and jr. high so as not to turn to them because there were large pictures of spiders on those pages. I’m not really sure what happened between then and now. But before when I felt fear when seeing spiders, I’m merely curious. I like to read about spiders now. Sometimes I’ll catch one and frighten my coworkers with it. I’m still not a big fan of killing them though. I’ve never really liked the crunch of the exoskeleton between my fingers (same applies to large, meaty flies). It doesn’t bother me nearly as much as before, though. So anyway, I’m not an arachnophiliac, despite what you or my coworkers may think. But my sense of curiosity, which is quite strong, now also extends to spiders. So guess how I reacted when I learned that there is a SPIDER THAT KNOWS HOW TO SWIM! Not just that it accidentally falls into some water and can paddle itself to some dry ground, but it actually DIVES! In fact, it spends it’s whole life in water! Have you ever heard of such a thing? Well, now you have! It is the diving bell spider, or Argyroneta aquatica. Note how large the male spider (left) is compared to the female. The diving bell spider is quite amazing. The males are remarkably large compared to the females, possibly because they actively swim and hunt for prey, so they can’t be puny like a lot of male land spiders. 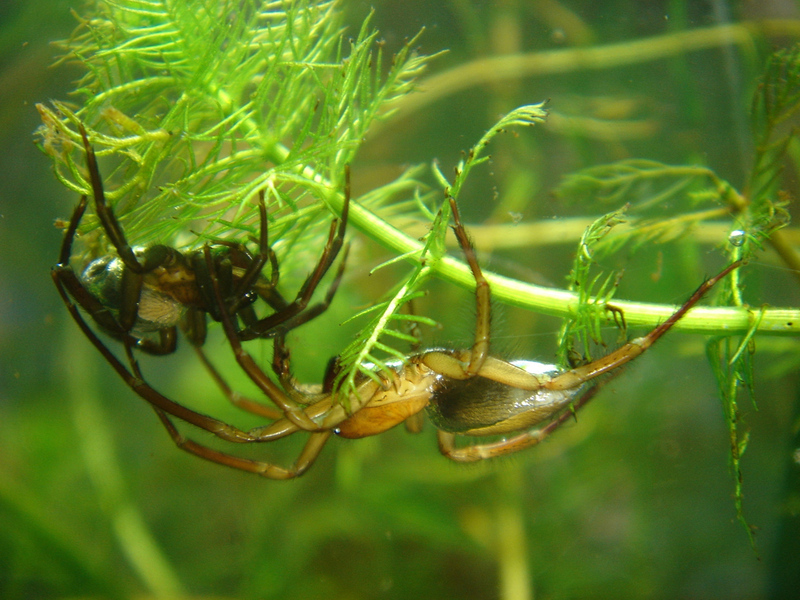 Diving bell spiders are also the only known species of spider that spends their entire life under water. BUT! It breaths oxygen and doesn’t have gills. How can it spend its entire life under water then? Why, they use a diving bell. The spiders apparently spin a web under water to trap an air bubble. They use their diving bell home to mate, molt, eat, and raise spiderlings (probably not a real word). Their diving bells are also quite efficient at exchanging gasses (O2, CO2, N2 [which ends up being unfortunate]) so they don’t often need to refill their bubble. Speaking of, they are able to carry a bubble of air around them by trapping air in the hairs around their abdomen and legs. It gives them that silvery appearance you see in the photo above. Here’s a video of the spider forming a diving bell. This spider is so interesting! I would like to see a live one for myself, but unfortunately for me, their habitat is in Europe and Asia. Here are a some links to more information about diving bell spiders, in case you’re interested.